Everyone knows that socio-economic inequalities in health exist – in recent times. But one thing we do not know is whether they have always been there. We have just published a study that looks at two historical datasets – with one of these suggesting life span differences by occupational class as measured 100 years ago. We find strong differences in life expectancy by occupational class among men enlisted to fight in the First World War (but not actually getting to the frontline). Whilst not definitive evidence (it is hard to get perfect evidence from 100 years ago! ), it does suggest that socio-economic inequalities in mortality have existed for at least 100 years in NZ. In this blog we also take the opportunity to discuss what might be done to address the current inequality problem in this country. 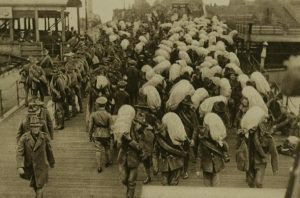 New Zealand Troops arriving in France. Socio-economic position (SEP) is an important risk factor for health internationally. A recent meta-analysis of 48 cohort studies reported that low SEP was the third most important risk factor for premature mortality . This work estimated that low SEP is associated with a 2.1-year reduction in life expectancy between ages 40 and 85 years. In NZ, absolute differences in life expectancy between high- and low-income groups have been estimated at 6.5 years for males and 4.7 years for females in 2001 . The gradients have been strongest for income, but they are also strong for small area deprivation and education [3, 4]. The ethnic health inequalities in NZ are even more marked [5, 6], and these have been described over long time courses [7, 8]. Eg, in 2011 there was a Māori vs non-Māori difference of 7.4 years for male life expectancy and 7.2 years for females . But data on the historical relationship between SEP and health for NZ is less clear – and mainly relates to the post-World War Two period [9-11]. One study has found that in the late 19th century “stature varied by social class, with professionals and men in rural occupations substantially taller than their peers” . (Average height of groups is a strong indicator of nutrition and socio-economic circumstances of the group; there is obviously a lot of individual variation within groups.) In contrast, however, there is no evidence of social class gradients from studies on pandemic influenza mortality in NZ in 1918 [13-15]. So what did our new study find? In our new study we aimed to study lifespan by occupational class in two cohorts: one based on men on the electoral rolls in Dunedin in the period 1893 to 1902, while the other used an established cohort of male military personnel who were recruited for the First World War but never saw active service (full free text of our new study here ). 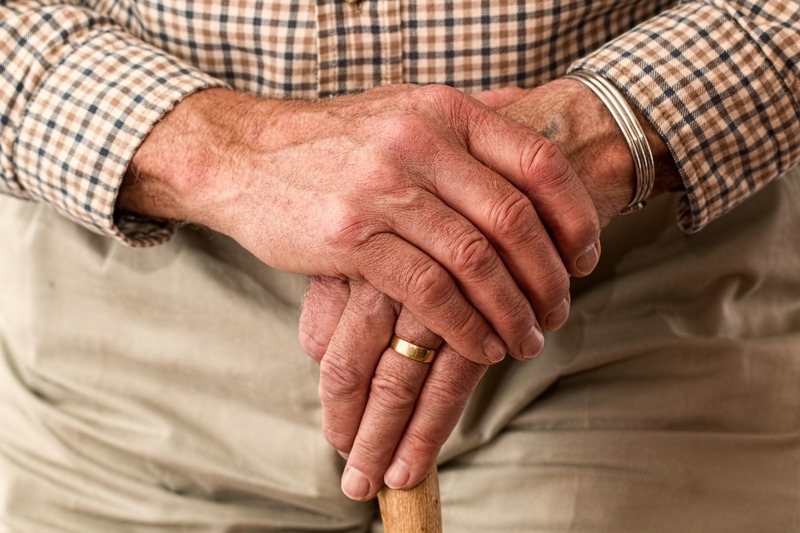 The first study of 259 men on the electoral rolls found no substantive lifespan differences between the high and low occupational class groups. But the second study of 2406 military personnel classified into nine occupational classes, found that men in the three highest occupational classes lived 3.5 years longer (95% CI: 0.3-6.8 years) than the three lowest classes (in the multivariable analysis adjusting for age in 1918 and rurality of occupation). The latter provides the earliest data to our knowledge suggesting differences in mortality by SEP in NZ prior to the 1960s. Our findings for significant differences by occupational class in the larger military cohort are consistent with historical reports of social class [17, 18], material differences across NZ society  (see the Figure below), and the previously discussed gradient in height . It also fits with historical evidence of former slum areas in some NZ cities (eg, the Te Aro district in Wellington ). Nevertheless, there were various limitations with studying both these historical cohorts (as we discuss in detail in our published study). Hence, neither of these cohorts can be considered definitive in establishing differences (or not) in lifespan by occupational class at this time – but certainly the military cohort results are still suggestive. So there is obviously a need for further research on this topic – which fortunately is becoming easier to do with the digitalisation of historical data. But how can modern NZ do more to address health inequalities? Continue to strengthen the focus on reducing ethnic inequalities – since these are the largest inequalities in terms of lifespan differences. Meeting obligations under the Treaty of Waitangi is critical and this includes addressing past injustices (eg, via Waitangi Tribunal processes), enhancing educational and employment opportunities for Māori, improving access to housing, and supporting improving Māori health. Many of these interventions can be targeted by area and so benefit all New Zealanders living in deprived areas. Getting rid of ethnic inequalities in health will take time. And there has been fairly steady (the 1980s and 1990s aside) progress to reduce these inequalities in the last 100 years. A continuation of this progress (which will not just happen by itself but which will require deliberate policy actions), might see the end of substantive inequalities in a generation. Benefiting all low-income New Zealanders via tax and welfare reforms eg, lowering income tax for people on low-incomes and ensuring welfare support is adequate to eliminate poverty (perhaps something that the Government’s new Tax Working Group will consider). Whilst redressing income and wealth inequalities is not sufficient by itself to redress health inequalities, it will have long legacy effects. Some of these issues are being tackled by the new NZ Government, especially with its important focus on reducing child poverty (which has long-term benefits to reduce inequalities in non-communicable diseases in adulthood). But for some of these issues the leadership by the new Government is still far from clear. Carter KN, Blakely T, Soeberg M. Trends in survival and life expectancy by ethnicity, income and smoking in New Zealand: 1980s to 2000s. N Z Med J. 2010;123(1320):13-24. Blakely T, Woodward A, Pearce N, Salmond C, Kiro C, Davis P. Socio-economic factors and mortality among 25-64 year olds followed from 1991 to 1994: the New Zealand Census-Mortality Study. N Z Med J. 2002;115(1149):93-97. Blakely T, Kawachi I, Atkinson J, Fawcett J. Income and mortality: the shape of the association and confounding New Zealand Census-Mortality Study, 1981-1999. Int J Epidemiol. 2004;33(4):874-883. Tobias M, Blakely T, Matheson D, Rasanathan K, Atkinson J. 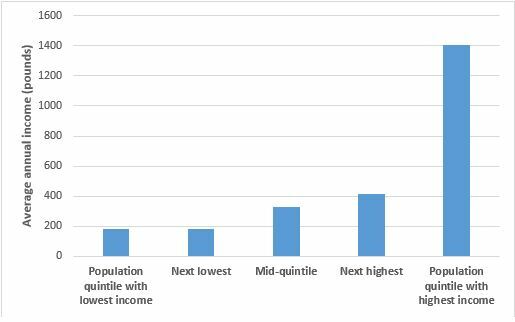 Changing trends in indigenous inequalities in mortality: lessons from New Zealand. Int J Epidemiol. 2009;38(6):1711-1722. Woodward A, Blakely T: The Healthy Country? A History of Life and Death in New Zealand. Auckland: Auckland University Press; 2014. Inwood K, Oxley L, Roberts E. Physical well-being and ethnic inequality in New Zealand prisons, 1840-1975. Hist Fam. 2015;20(2):249-269. Pearce NE, Davis PB, Smith AH, Foster FH. Mortality and social class in New Zealand. I: overall male mortality. N Z Med J. 1983;96(730):281-285. Pearce NE, Davis PB, Smith AH, Foster FH. Mortality and social class in New Zealand II: male mortality by major disease groupings. N Z Med J. 1983;96(740):711-716. Copplestone JF, Rose RJ: Occupational mortality among male population, other than Maori, 20 to 64 years of age. Based on deaths 1959-63 and population census 1961. Wellington: National Health Statistics Centre Department of Health, 1967. Inwood K, Oxley L, Roberts E. Physical stature in nineteenth-century New Zealand: a preliminary interpretation. Aust Econ Hist Rev. 2010;50:262-283. Summers JA, Wilson N, Baker MG, Shanks GD. Mortality risk factors for pandemic influenza on New Zealand troop ship, 1918. Emerg Infect Dis. 2010;16(12):1931-1937. Summers JA, Stanley J, Baker MG, Wilson N. Risk factors for death from pandemic influenza in 1918-1919: a case-control study. Influenza Other Respir Viruses. 2014;8:329-338. Rice G: Black November: The 1918 influenza pandemic in New Zealand. Christchurch: Canterbury University Press; 2005. Wilson N, Clement C, Boyd M, Teng A, Woodward A, Blakely T. The long history of health inequality in New Zealand: occupational class and lifespan in the late 1800s and early 1900s. Aust N Z J Public Health. 2018;(E-publication 15 February). Pitt D: (Ed). Social class in New Zealand. Auckland, Longman Paul Ltd, 1977. Olssen E, Griffen C, Jones F: An Accidental Utopia? Social Mobility and the Foundations of an Egalitarian Society, 1880-1940. Dunedin: Otago University Press, 2011. Phillips J: Class – A middle-class society? – material differences, 1890 to 1970. Te Ara – the Encyclopedia of New Zealand, http://www.TeAra.govt.nz/en/class/page-4 (accessed 29 December 2016). Schrader B. The Big Smoke: New Zealand Cities 1840-1920. Wellington: Bridget Williams Books, 2016.
van der Deen FS, Wilson N, Cleghorn CL, Kvizhinadze G, Cobiac LJ, Nghiem N et al. Impact of five tobacco endgame strategies on future smoking prevalence, population health and health system costs: two modelling studies to inform the tobacco endgame. Tob Control. 2017;(E-publication 24 June).